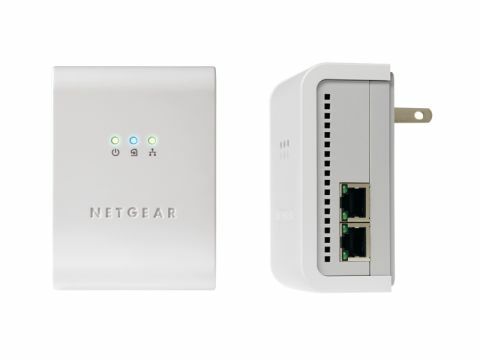 The Netgear 85 Mbps Powerline Switch Kit consists of two adapters, two Ethernet cables and documentation. The adapter is made of white and grey plastic and has the same styling as Netgear's other home networking products. Three reasonably large and bright LED lights are in place that signify when the device is plugged in, connected and secure. Setup is incredibly easy, as you simply plug the Powerline in and the first LED light signals whether the connection is made. Unlike some other plugs, you won't find a hardware security connection, so you'll need to set up the supplied software to change the default encryption settings. The Powerline is referred to as a Switch Kit, while other devices are Starter Kits. This is because, unlike the other devices that all have one Ethernet port, the Netgear comes with four. This means you can easily add four machines in one room to the same connector, which makes it a cost-effective solution if you need to hook up a laptop as well as games console, for instance. You'll find there are two ports on either side of the device, which we thought may cause trouble when using the plug in twin wall sockets. Thankfully, the Powerline is quite bulky and the design means the ports sit below the plug socket – something worth considering if you have skirting board-mounted wall sockets. The main disadvantage with this powerline adapter is in overall throughput, and you'll find the Netgear tops out at 85Mbps, as opposed to the 200Mbps on offer from the latest breed. The Netgear 85 Mbps Powerline is starting to show its age and lacks the latest Powerline speeds and security options. However, if you're looking to add more than one device to a network, it is a reasonable choice. It doesn't offer the fastest throughput and you won't be able to use it for streaming HD content, but it is versatile and easy to use.